Forming a relationship with a horse is a great opportunity. Not only because horses are another species, and we can learn so much about ourselves and them from the process of developing a mutual communication, but also because we can ride them. This adds a whole new dimension to our relationship, because we can connect with them physically and create a new being. As well as feeling great, this kind of rapport can also be healing for rider and horse. The more we work with different horses, the more important it seems to us to get to the root of any problems they may have, whether they seem to be mental or physical. 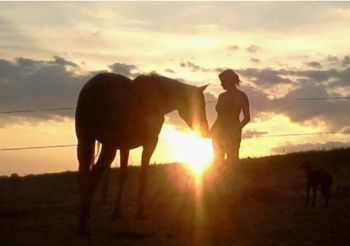 This has led us to realize that all horses are, like us, living their lives in order to rediscover their true nature. In other words, we work with horses because we want to heal them, and in this process we are healing ourselves. Being healed, as we see it, is a state of mind. Other names for this state of mind are to be enlightened, or present. The enlightened state of mind is of course a well known aspiration for human beings, and many people believe that remembering this state of mind is our purpose in life. I say 'remembering' in order to try to explain more truthfully our situation as humans. Most of us perceive ourselves as separate from each other. This is an illusion, and the illusion is what we need to heal. In fact we are all perfect beings and capable of enlightened consciousness, so we need not change ourselves. In that sense it is not so much a journey of discovery but a journey of rediscovery, although even the concept of 'journey' is a misleading. What Does Horse Healing Mean? Our work with horses started out like most people, because we enjoyed jumping ponies and galloping as fast as we could, and since then we have made a long and interesting learning curve. A learning curve that started with the realization of how much we must develop ourselves physically as riders, because everything we do and are as a rider influences the horse. At some point during this process we became aware that the physical part of it is just one side of the coin, that the rapport a rider creates with a horse is initially an emotional one, and that in fact many physical issues have an emotional source, and we would never see the whole picture without recognizing the importance of our own feelings and those of the horse. Seeing the whole picture is the reason why our approach to the whole subject of horses is holistic. Without addressing everything that influences the horse's life, we will never achieve a perfect harmony in the arena. If a horse has a miserable, boring life in a stable, he will not open up his heart to you when you take him into the school for an hour. 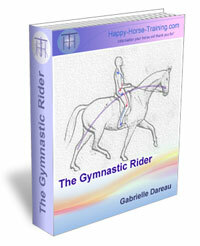 Horse healing goes hand-in-hand with the transformation that takes place in the training process. So as we became more aware of the emotions of our horses and their personalities, and opinions even, we were in fact becoming more aware of their state of mind. We understood firstly that like people, horses cannot learn or truly respond to us when they are in a state of tension. Tension is a complicated subject. It is a state of mind which, like any state of mind, has physical effects. What makes it so important for horse owners is that these physical effects have a habit of fixing themselves in the body, each layer of restriction becomes a bit like a page in a book. If a horse is sufficiently disturbed by an event - and this doesn't have to seem to us like a very big deal at the time - the event will be stored in the tissues of the body. The same is true for us. Even falling over a step you didn't expect will be memorized in certain postural muscles if the central nervous system is shocked into over-contracting them. Sometimes those muscles will stay in a continuous spasm which will have effects right through your body. In fact all animals, horses, and people included, are like books full of pages, memorizing all the events in our lives which have damaged us in one way or another. The pages are often referred to as layers, and the whole book as the pattern. Major events such as birth trauma and bad falls, can overshadow the other layers, but the layers do seem to be stored chronologically, so as they resolve it is possible to trace back the history over time. In our experience of working with rescue horses and those of clients which have behavioral problems, we have found that horse trauma is very common. Wild horses suffer traumatizing events all the time during their lives, but they do not become traumatized, whereas a surprisingly high number of domesticated horses are indeed traumatized, and remain so throughout their lives. We have been particularly concerned with this phenomenon because it is often the reason why a horse problem seems to remain unresolved, no matter how much time and money is thrown at it. 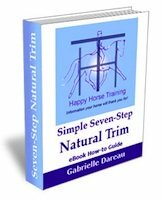 See Horse Trauma and How To Heal It for an in depth discussion of this subject. 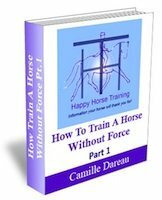 An eBook describing our unique research on horse trauma comes free when you buy How To Train A Horse Without Force. Not all tension comes from trauma however, in fact every horse has a pattern of physical and emotional tensions stored within themselves. Tension just means a restriction. It can be a muscle in spasm, or a stored emotion from a bad experience. The pattern obviously has a huge influence on what a horse can do for you, and who he is in himself. A horse which has a very 'heavy' pattern will be obviously stiff and not very present in himself. This idea takes us back to the subject of a horse's state of mind. The more layers of unresolved tension that are present in a person or a horse, the less present they will be in their minds. This is why the process of horse healing is so important to training. Why Is Horse Healing Important for Horse Owners? What makes this tension so important when working with horses is that if a horse is not present mentally, they can't listen to you, and they can't respond to your aids. They may move in and out of a tense state of mind depending on the external environment and how they are feeling in themselves, but at the end of the day these layers must be addressed if true progress is to be made. Addressing these layers, is what we call horse healing. The more healed a horse becomes, the more present they are, and the more of themselves they are able to give you. The connection you feel with a horse when you can be present with him, especially if you have achieved it together from a previous time of discord and unhappiness, is magical. Our process of horse healing, or horse rehabilitation, combines whichever horse therapy we feel will be of benefit, including Craniosacral Therapy (left), herbal support, homeopathy, and in certain cases Osteopathy, along with a consistent gymnastic training which can be seen as physiotherapy as well as dressage training because it addresses systematically all the weaknesses a horse may have physically. We have found that when we can carry out this process of training and healing - while keeping the horses in the form of management we have developed which compensates as much as possible for their domestication - many of their emotional problems resolve by themselves at some stage along the line. The kinds of behavioral problems in horses we have been able to resolve, without any kind of gadgets or repetitive conditioning techniques, are bucking horses and rearing horses, spooking, napping and bolting horses. Horses suffering from panic attacks and severe lack of balance. Head-shaking horses, horses refusing to move or very reluctant to move and extremely sensitive horses, both to the leg and to the riders presence in the saddle. Physical problems we have resolved through the therapeutic techniques and the gymnastic training include many different forms of neck and back problems, pelvic imbalances and joint injury. Metabolic imbalances and different types of lameness. Conditions involving horses' feet, and chronic organ problems have all responded very well. We have found that if you can provide enough support in terms of natural remedies and good quality nutrition, and you can recognize the health problem in physical and emotional terms so that their own healing systems respond, then the extent to which a horse can heal themselves is only limited by that individual horse's own choice. You can't make horses drink and, just like people, you can't make them heal themselves! If they choose to however, there really is no limit to what is possible. 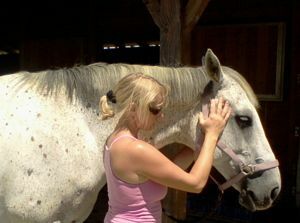 The way we see it, horse healing addresses both the physical and emotional issues which will then alter the behavior. Horses behavior depends on how they feel, so if they are behaving badly it means they feel bad, either in their body, in their mind, or both. In the rare occasions when there is a particular association triggering a particular behavior, there are usually straight-forward ways to interrupt the association. This hardly ever happens outside of a long chain of related events which have been building up over time. Going back to the source is always the long term answer to horse healing, whatever the symptom may be.